I have some experience of terrorism. I was a grad student living in central London during the 1970s IRA bombing campaign. My father worked at Harrods, which was later the target of two successful bomb attacks, in 1983 and 1993. During the 1970s campaign he was in charge of the store's response to the numerous bomb threats it received. He worked out that, given that most of the threats were bogus, evacuating the store for each of them would cause more casualties than would an occasional bomb going off in the building. So he designed and the store implemented a plan by which staff would search the entire building in, as I recall, less than three minutes. If anything suspicious was found, that area would be evacuated. As a result, the 1974 bomb was successfully defused. The two later bombs that did explode were outside the building. In 2001 my brother had a business partner who had just left Cantor Fitzgerald. On September 11 that man lost almost all of his close friends. On July 7, 2005 the headlines in the morning papers were that London had been chosen over Paris as the site of the 2012 Summer Olympics. That morning I was meeting with colleagues at University College, London, just around the corner from Tavistock Square where the 4th bomb of the day went off, killing 13 of the 52 victims of the day. We knew about the earlier bombs and, as Londoners, were familiar with the sound of a bomb. When we heard it we looked at each other and said "that was close, we need to get away from here". One of my colleagues was disabled, and had parked his car in a reserved parking spot just outside. As we rushed out of the building, on the pavement, I bumped into a man walking rapidly away from the square. He was dead-panning to his companion "It must have been the French". We all laughed. I live in Manhattan, in Chelsea, on 27th Street between 6th and 7th, the same block in which the second IED was found. It was a surreal weekend, but it is increasingly becoming depressing as the media moves from providing information to stoking fear, the exact response that makes these events so effective. Traditional news media has a lot of say in what it publishes. This is one of the major things that distinguishes it from social media, which propagates the fears and anxieties of the public. And yet, time and time again, news media shows itself to be irresponsible, motivated more by the attention and money that it can obtain by stoking people’s fears than by a moral responsibility to help ground an anxious public. From 7 September 1940, ... London was systematically bombed by the Luftwaffe for 57 consecutive nights. More than one million London houses were destroyed or damaged and more than 40,000 civilians were killed, almost half of them in London. 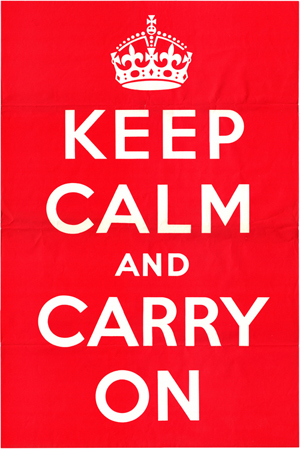 The correct response to bombings, whether by the Luftwaffe or the allied air forces, the IRA or ISIS-inspired loners is Keep Calm and Carry On. And, if possible, do as the gentleman I bumped into did, and make jokes about the bombs. The media "feeding the trolls" makes that really hard, and thus helps the bombers. Frank Rich's The Chelsea Bombing Shows That Americans Are Getting a Better Perspective on Terrorism has a slightly more optimistic take on American attitudes to terror as revealed by the reaction to the incidents danah boyd wrote about. Patrick Coburn's Why Politicians Are to Blame for Most Terrorist Attacks shows an understanding of what is going on. Nemil Dalal's How Media Fuels Our Fear of Terrorism is a worthwhile examination of the enormous bias in the media's coverage or terrorism. The animation of the New York Times' 5-day saturation coverage of the Orlando massacre is especially telling. PS: Shouldn't it be How Media Fuel Our Fear of Terrorism? "has however been credited for starting the city's mass regeneration and turning Manchester into a modern British "powerhouse" city with above national average economic growth in the 20 years following the bombing." Rossalyn Warren's New York Times op-ed is a much better guide to the response to the London Bridge attack than the NYT's somewhat hysterical reporting. I'd say Teresa May's slump in the polls has gotten ISIS worried. "And it found its purest expression in Chris and Isabel Charlton, strolling hand in hand in the sunshine, eight months married; pausing, as it happened, right where the police lines began, to kiss in the middle of the street. You couldn’t let the terrorists win, said Mr Charlton, 39. You couldn’t succumb to hate. “You’ve got to carry on,” he added. It could have been them, caught up in a terrorist rampage that left seven dead after a van ploughed into pedestrians on London Bridge, before moving on to Borough Market where attackers started stabbing people.